[Note of the editor] This article was published in 2003 as: David A. King, "The renaissance of astronomy in Baghdad in the ninth and tenth centuries: A list of publications, mainly from the last 50 years” at www.davidaking.org (link). 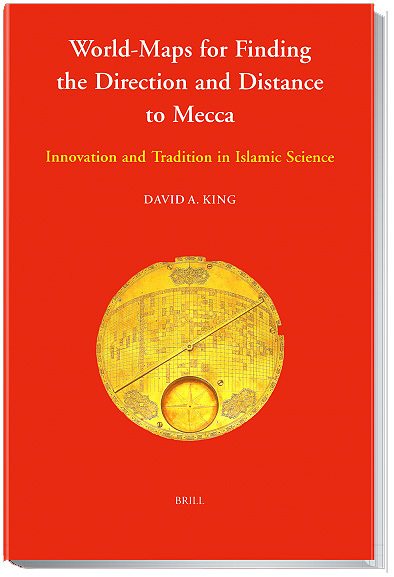 We are grateful to Prof. King for permitting republishing on the Muslim Heritage website. "The ancients distinguished themselves through their chance discovery of basic principles and the invention of ideas. The modern scholars, on the other hand, distinguish themselves through the invention of a multitude of scientific details, the simplification of difficult (problems), the combination of scattered (information), and the explanation of (material which already exists in) coherent (form). The ancients came to their particular achievements by virtue of their priority in time, and not on account of any natural qualification and intelligence. Yet, how many things escaped them which then became the original inventions of modern scholars, and how much did the former leave for the latter to do!" The poet, litterateur and maker of astronomical instruments Hibat Allâh al-Baghdâdî (Baghdad, ca. 1120), partly quoting the astronomer-mathematician Abû Ja’far al-Khâzin (Rayy, ca. 980), as translated by Franz Rosenthal, "Al-Asturlâbî and as-Samaw’al on Scientific Progress", Osiris 9 (1950), pp. 555-564, esp. p. 559. "The legacy of the translation movement in Islamic societies was profound and manifold, but it is historically inaccurate to talk about it in isolation from the Arabic scientific and philosophical tradition which fostered it throughout its existence. One should avoid generating the false impression that the translations, once executed in a receptive phase, caused the development of Arabic philosophical and scientific thinking during a subsequent creative phase of this tradition." Dimitri Gutas, Greek Thought, Arabic Culture (see §1), p. 192. No concerted effort has been made in Frankfurt – or anywhere else, for that matter – to document the history of astronomy in eighth-, ninth- and tenth-century Baghdad. Rather, most of the studies listed below just evolved naturally as a result of the fact that most of what we specialists study in relation to astronomy in medieval Islam and medieval Europe began right there and then. Also, we can only claim to have scratched the surface of this subject. Many texts originally from this milieu have been listed by F. Sezgin in his bio-bibliographical survey of Arabic literature up to ca. 1100 (see below). Most of the original manuscripts used by the Frankfurt team were discovered in libraries around the world in the 1970s and 80s. The reader should be aware of the existence of earlier studies by such scholars as the Sédillots père et fils, C. A. Nallino, H. Suter, O. Neugebauer, D. Pingree, E. S. Kennedy, and P. Kunitzsch. Some of them could not possibly be left out of this bibliography for sentimental reasons, even though they predate, say, 1980. For the newcomer to this field, the best place to start is Kennedy et al., Studies (§1). For bio-bibliographical information on Muslim scientists go to Sezgin, GAS, V-VII (till ca. 1100); Suter, MAA, Matvievskaya & Rosenfeld, MAMS, and Cairo ENL Survey (all periods); and Ihsanoglu et al., Ottoman Scientific Literature (Ottoman Empire) (all listed in §1). There has been a tendency amongst scholars – even specialists in the history of Islamic science – to be pre-occupied with the Graeco-Arabic translation movement, as if it were the only aspect of Islamic science that was of any ultimate concern. 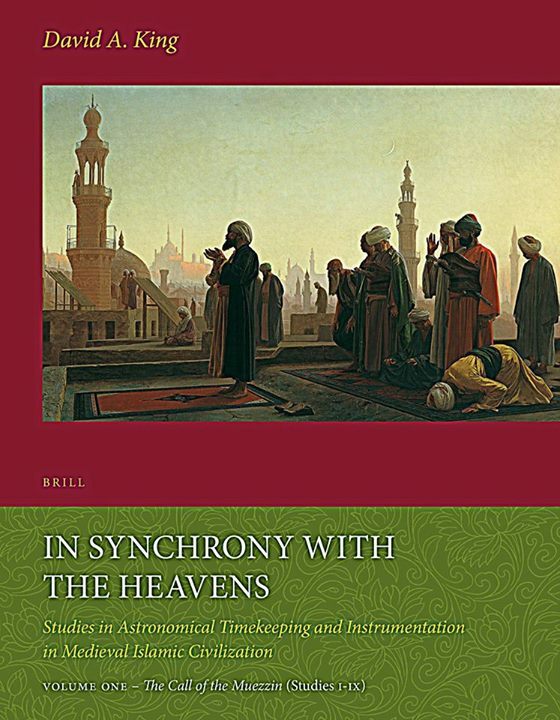 Fortunately one scholar, David Pingree, has been concerned also with the Indian and Iranian influence in early Islamic astronomy. Many of the studies listed below deal with an "Islamic astronomy" in the 9th century that was already a respectable discipline in its own right, but this phenomenon occurred at the very same time as the main translations of such works as the Almagest became available. 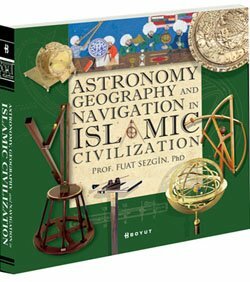 Perhaps we should not call it "Islamic astronomy", but rather "astronomy in Islamic civilization", for a substantial number of the contributors were not Muslims, but rather Christians, Jews or Sabians; these were, however, always a minority on the overall scene. Some of the Muslims involved were Arabs, but a substantial number, even a majority, were originally of Iranian or Central Asian origin. Call it what you will, "Islamic astronomy" used methods and materials that were ultimately of Greek or Indo-Iranian origin, but it also produced with remarkable speed a corpus of new methods and materials, including all sorts of tables computed specifically for Baghdad. So, for example, we note that the astronomical handbook with tables prepared for Caliph al-Ma’mûn ca. 825 and known as the Mumtahan Zîj appeared on the scene at the same time as the first real translation of the Almagest. The Mumtahan Zîj is already an Islamic work, quite different in style and content from the Almagest. Also, at the same time, there appeared a cluster of other works that have come to light only in recent years: these deal with astronomical instrumentation and the application of astronomical procedures to aspects of Islamic religious ritual: the lunar calendar, the astronomically-defined times of Muslim prayer, and the sacred direction (qibla) towards the Kaaba in Mecca. Since much of later Islamic astronomy was devoted to such themes, it is an error to think that even later Islamic astronomy was heavily dependent on any Greek tradition. Already by the 9th century it was "Islamic", and such it remained for a millennium thereafter. 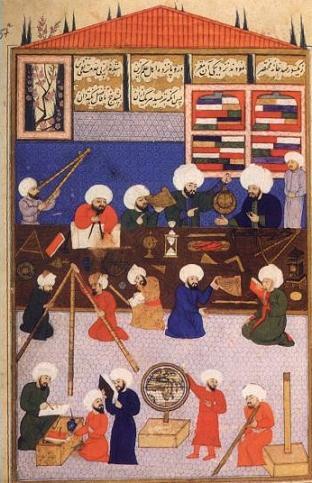 The fact that there existed an important tradition of translations of Greek works and commentaries thereon within Islamic astronomy but without overpowering influence on it – the amount of influence was dependent on time, on location and on the personalities involved – should be taken into account. 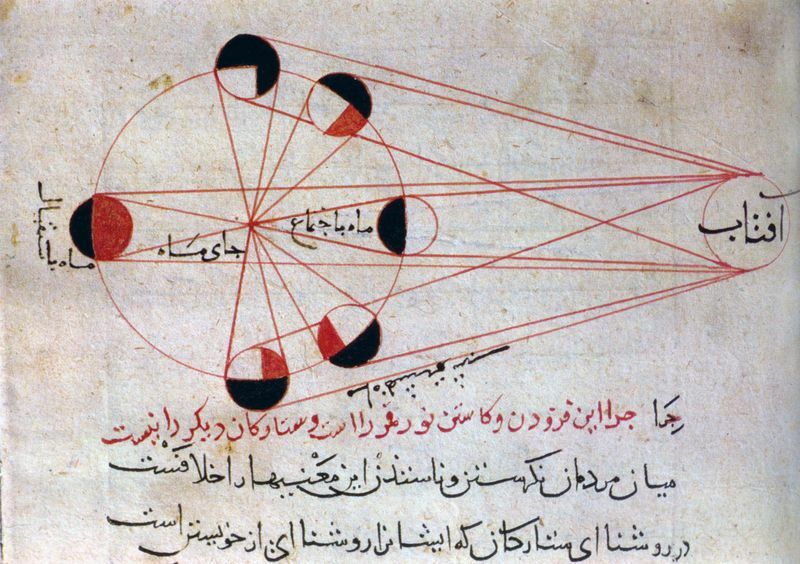 In any case, since the Graeco-Arabic translation movement has received considerable attention it seems appropriate now to take a broader look at Islamic astronomy. Certainly a serious study of the birth and early development of Islamic science is still a task for the future. The reader should also be aware that this is not a bibliography of Islamic astronomy as such; also, many works on early Islamic mathematics could have been included but have not been. (Bibliographies of the history of Islamic mathematics tend to overlook astronomy, even though the history of Islamic mathematical methods cannot be written without taking astronomical works into consideration.) Similar bibliographies could be prepared – but not in Frankfurt at this time – for, say, studies of al-Bîrûnî, of regional schools of Islamic astronomy, of astronomy in al-Andalus, of astronomy in the service of Islam, etc. 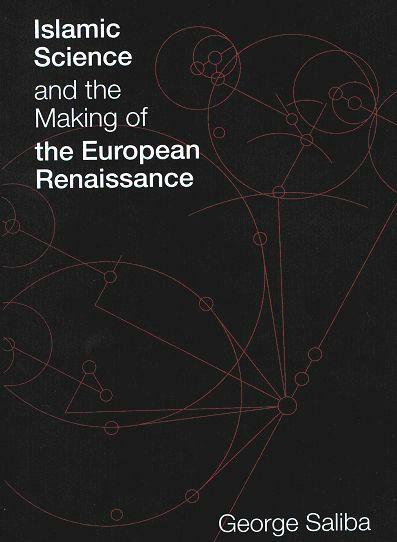 A rich bibliography on transmission is in Richard P. Lorch, "Greek–Arabic–Latin: The Transmission of Mathematical Texts in the Middle Ages", Science in Context 14 (2001), pp. 313-331. For the numerous publications of Fuat Sezgin and his colleagues at the Institute for the History of Arabo-Islamic Sciences in Frankfurt please click here. 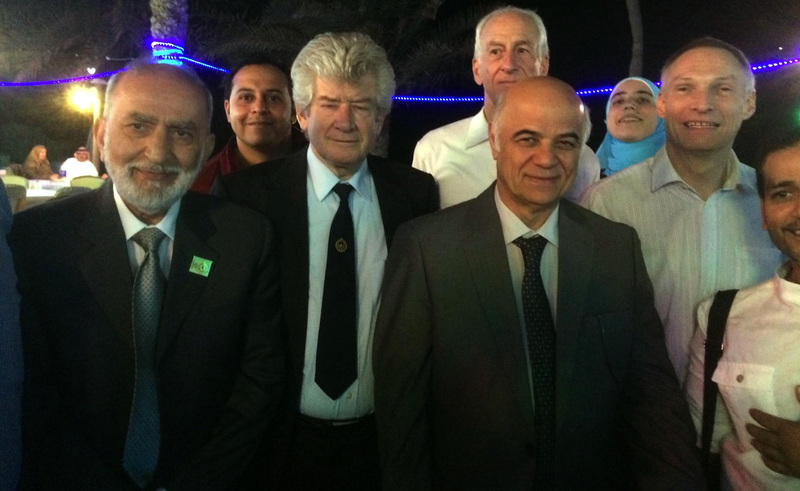 Astronomy in Baghdad in the 9th and 10th centuries – specialized studies. "Anwâ’" (aspects of folk astronomy), "Asturlâb" (astrolabe), "’Ilm al-hay’a" (here: astronomy generally), "’Ilm al-hisâb" (arithmetic), "Kamar" (moon), "Kibla" (religious and astronomical aspects of the sacred direction), "Kutb" (celestial pole), "Layl and Nahâr" (aspects of folk astronomy), "Makka. iv: as centre of the world" (sacred geography), "Manâzil" (lunar mansions), "Matâli’" (right and oblique ascensions), "Matla’" (astronomical risings and settings), "Mayl" (declination and obliquity), "Mîkât. ii. astronomical aspects" (astronomical timekeeping), "Mintaka" (ecliptic, zodiac and obliquity), "Mizwala" (sundial), "Nudjûm" (stars); "Nudjûm, ‘Ilm ahkâm al-" (astrology), "Rîh" (winds in the folk-astronomical tradition), "Rub’" (quadrant), "Samt" (direction), "Shakkâziyya" (universal astrolabic projections), "Shams" (sun), "Ta’rîkh. 2. Era chronology in astronomical handbooks" (calendrics in zîjes), "Tâsa" (magnetic compass), "Zîdj" (astronomical handbooks and tables). King, SATMI: David A. King, Studies in Astronomical Timekeeping in Medieval Islam, 12 pts., in press with E. J. Brill, Leiden. Parts I-VI and X-XII are to appear with the title The Call of the Muezzin. Samsó: see also the many studies of the Millás-Vernet–Samsó Barcelona school, some of which are listed at www.ub.es/arab. Samsó: see also King & Samsó above. Sezgin: see also Islamic Astronomy and Mathematics; Islamic Geography; and all publications of the Institut für Geschichte der Arabisch-Islamischen Wissenschaften, Frankfurt am Main. See also Dimitri Gutas, Greek Thought, Arabic Culture: The Graeco-Arabic Translation Movement in Baghdad and Early ‘Abbâsid Society (2nd-4th/8th-10th centuries), London & New York: Routledge, 1998, which provides part of the background for studies on early Islamic science. www.rz.uni-frankfurt.de/~dalen/ , then params.htm and programs.htm. This project was inspired by E. S. Kennedy’s 1956 Zîj Survey (§1), to which now add the interim report in King & Samsó (§1). * A major publication by Benno van Dalen is anticipated. On the methodology see already his studies: "A Statistical Method for Recovering Unknown Parameters from Medieval Astronomical Tables", Centaurus 32 (1989), pp. 85-145; and Ancient and Mediaeval Astronomical Tables: Mathematical Structure and Parameter Values, Utrecht: Universiteit Utrecht, 1992. * This article was prepared on the occasion of the Encyclopaedia of Islam reaching the letter "Z" but turned out to be too long to be accepted for the article "Zîdj". A project to catalogue all medieval astronomical instruments, both Islamic and European, conducted by David A. 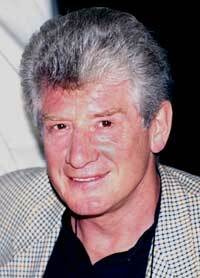 King, and supported by the German Research Organization (DFG) during 1992-96 and 1996-2002. See further DAK, "Medieval Astronomical Instruments: A Catalogue in Preparation", Bulletin of the Scientific Instrument Society 31 (Dec., 1991), pp. 3-7, and for an overview of the potential of medieval instruments as historical sources see DAK, "Astronomical Instruments between East and West", in Harry Kühnel, ed., Kommunikation zwischen Orient und Okzident, Vienna: Österreichische Akademie der Wissenschaften (Sitzungsberichte, Phil.-Hist. Klasse, vol. 619), 1994, pp. 143-198. Additional funding and new collaborators will be necessary to complete this project. Paul Kunitzsch, "Über das Frühstadium der arabischen Aneignung des antiken Gutes", Saeculum 26 (1975), pp. 268-282. See the overview article of King & Samsó in §1 and the description of the zîj project in §3a. [Notes: The only surviving version of the only surviving version of the astronomical handbook of al-Khwârizmî, a Latin translation of an Andalusi recension, was published by H. Suter in 1914, with a translation of the text and commentary by O. Neugebauer in 1962 (see below). The Mumtahan Zîj of Yahyâ ibn Abî Mansûr and the Zîj of Habash remain unpublished, although J. Vernet and M.-Th. Debarnot have published overviews of the Escorial manuscript of the former and of the Istanbul manuscript of the latter (see below). 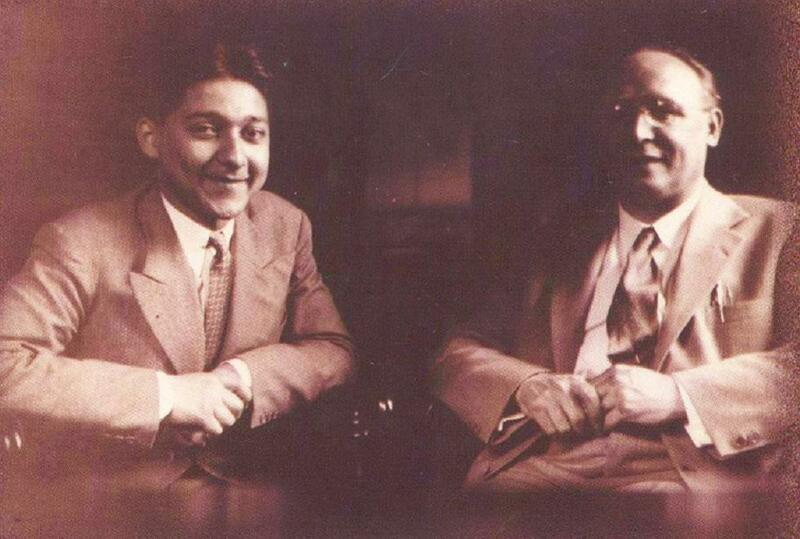 Most 19th- and early-20th-century studies are reprinted in the multi-volume Islamic Mathematics and Astronomy (§1). E. S. Kennedy and Walid Ukashah, "al-Khwârizmî’s Planetary Latitude Tables", Centaurus 14 (1969), pp. 86-96, repr. in Kennedy et al., Studies (§1), pp. 125-135. E. S. Kennedy, "The Solar Equation in the Zîj of Yahyâ ibn Abî Mansûr", in Hartner Festschrift (§1), pp. 183-186, repr. in Kennedy et al., Studies (§1), pp. 136-139. E. S. Kennedy and Nazim Fares, "The Solar Eclipse Technique of Yahyâ ibn Abî Mansûr", Journal for the History of Astronomy 1 (1970), pp. 20-38, repr. in Kennedy et al., Studies (§1), pp. 185-203. Jamil Ali as-Saleh, "Solar and Lunar Distances and Apparent Velocities in the Astronomical Tables of Habash al-Hâsib", Al-Abhâth (Beirut) 23 (1970), pp. 129-177, repr. in Kennedy et al., Studies (§1), pp. 204-252. F. Jamil Ragep, "Al-Battani, Cosmology, and the Early History of Trepidation in Islam", in Vernet Festschrift (§1), pp. 267-303. E. S. Kennedy, "The Lunar Visibility Theory of Ya’qûb ibn Târiq", Journal of Near Eastern Studies 27 (1968), pp. 126-132, repr. in Kennedy et al., Studies (§1), pp. 157-163. Yusuf Id, "An Analemma Construction for Right and Oblique Ascensions", The Mathematics Teacher 62 (1969), pp. 669-672, repr. in Kennedy et al., Studies (§1), pp. 495-498. Nadi Nadir, "Abû al-Wafâ’ on the Solar Altitude", The Mathematics Teacher 53 (1960), pp. 460-463, repr. in Kennedy et al., Studies (§1), pp. 280-283. See the description of the project in §3b above. Paul Kunitzsch, "Al-Khwârizmî as a Source for the Sententie astrolabii", in Kennedy Festschrift (§1), pp. 227-236, repr. in idem, Studies (§1), IX. JH, "The Contributions by Abu Nasr ibn ‘Irâq and al-Saghânî to the Theory of Seasonal Hour Lines on Astrolabes and Sundials", Zeitschrift für Geschichte der arabisch-islamischen Wissenschaften (Frankfurt) 14 (2001), pp. 1-30. E. S. Kennedy and Yusuf Id, "A Letter of al-Bîrûnî: Habash al-Hâsib’s Analemma for the Qibla", Historia Mathematica 1 (1973), pp. 3-11, repr. in Kennedy et al., Studies (§1), pp. 621-629. For the basic concepts the newcomer should consult R. Ramsey Wright, transl., The Book of Instruction in the Elements of the Art of Astrology by ... al-Bîrûnî, London: Luzac & Co., 1934, pending a new edition currently in preparation. E. S. Kennedy, "The Sasanian Astronomical Handbook Zîj-i Shâh and the Astrological Doctrine of "Transit" (mamarr)", Journal of the American Oriental Society 78 (1958), pp. 246-262, repr. in Kennedy et al., Studies (§1), pp. 319-335. E. S. Kennedy and B. L. van der Waerden, "The World-Year of the Persians", Journal of the American Oriental Society 83 (1963), pp. 315-327, repr. in Kennedy et al., Studies (§1), pp. 338-350. E. S. Kennedy, "The World-Year Concept in Islamic Astrology", in the Proceedings of the International Congress of the History of Science, Ithaca, N.Y., 1962, repr. in Kennedy et al., Studies (§1), pp. 351-371. C. Burnett and A. al-Hamdi, ‘Zadanfarrukh al-Andarzaghar on Anniversary Horoscopes’, Zeitschrift für Geschichte der arabisch– islamischen Wissenschaften, 7, 1991/2, pp. 294–398. C. Burnett, "Al-Kindî on Judicial Astrology: "The Forty Chapters"", Arabic Sciences and Philosophy, 3, 1993, pp. 77–117. Abu Ma‘shar, The Abbreviation of the Introduction to Astrology, together with the Medieval Latin translation of Adelard of Bath, ed. and transl. C. Burnett, K. Yamamoto and M. Yano, Leiden: Brill, 1994. Abû Ma’shar al-Balkhî, Liber intoductorii maioris ad scientiam judiciorum astrorum, ed. Richard Lemay, 9 vols., Naples: Istituto Universitario Orientale, 1995-96. The Liber Aristotilis of Hugo of Santalla, eds C. Burnett and D. Pingree, Warburg Institute Surveys and Texts 26, London: Warburg Institute, 1997. Scientific Weather Forecasting in the Middle Ages: The Writings of Al-Kindi, ed. and transl. Gerrit Bos and C. Burnett, London: Kegan Paul International, 2000. Abû Ma’shar, On Historical Astrology. The Book of Religions and Dynasties (On the Great Conjunctions), K. Yamamoto and C. Burnett, 2 vols., Leiden: E. J. Brill, 2000. Abu Ma‘shar on Historical Astrology, The Book of Religions and Dynasties (On the Great Conjunctions), ed. and transl. K. Yamamoto and C. Burnett, 2 vols, Leiden: Brill, 2000. Paul Kunitzsch, "The Chapter on the Fixed Stars in Zarâdusht’s Kitâb al-mawâlîd", Zeitschrift für Geschichte der arabisch-islamischen Wissenschaften (Frankfurt) 8 (1993), pp. 241-249. Hermes, Liber de stellis beibeniis, Paul Kunitzsch, ed., in Hermetis Trismegisti Astrologica et Divinatoria (Corpus Christianorum, Continuatio Medievalis, CXLIV C = Hermes Latinus IV, iv), Turnhout: Brepols, 2001, pp. 7-107. Al-Qabîsî, Introduction to Astrology, ed. and transl. C. Burnett, K. Yamamoto and M. Yano, Warburg Institute, Studies and Texts, London: Warburg Institute, 2003 (in press). Kûshyâr ibn Labbân’s Introduction to Astrology, ed. and transl. M. Yano, Tokyo: Institute for the Study of Languages and Cultures of Asia and Africa, 1997. Régis Morelon, "Fragment arabe du premier livre du Phaseis de Ptolémée", Journal for the History of Arabic Science 5 (1981), pp. 3-22.